Bowling pins for ten-pin bowling. A standard bowling ball is 8.5 inches to 8.595 inches (about 22 cm) in diameter. A standard ten-pin bowling pin is 4.75 inches (about 12 cm) at its widest point, which is 4.5 inches (11.5 cm) above the lane surface. That's a little more than the radius of the ball. The pins are spaced exactly 12 inches (about 30.5 cm) apart. That means that the space between pins at their widest point is about 2.5 inches (about 6.4 cm). In other words, the ball diameter is about 3.5 times the space between the pins. 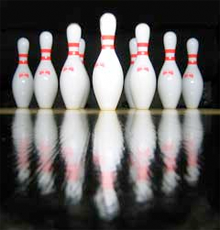 If the bowler can roll the ball so it stays out of the gutter, knocking pins down is a certainty. Conventional conflict resolution makes certain assumptions about conflict, including the assumption that the parties to the conflict would prefer a healthy relationship to a relationship burdened with toxic conflict. That assumption is not valid for the bully-target relationship — at least, not from the point of view of the bully. Trying to resolve a bullying issue with conventional conflict resolution techniques is like bowling with golf balls. Photo (cc) Stefan Grazer. When we must make quick decisions about emotional issues, we're more likely than usual to make mistakes. It's helpful in those situations to have distilled what we believe into guidelines we can easily recall when we need them. Here are some memorable guidelines for dealing with bullying. Letting yourself be bullied without end isn't a success strategy. Ignoring bullying won't cause the bully to get bored and find another target. It's more likely to convince the bully to do something you can't ignore. Hiring an attorney won't stop the bully, but it will make your employer aware that you're a threat. Your employer must then decide which threat it fears more — you or the bully. If you do hire an attorney, be certain that your employer will fear you more than the bully. Trying to end bullying by avoiding the bully is as likely to succeed as trying to survive while swimming in shark-infested waters by avoiding sharks. Humor can deflect a bully's attack if the attack is public and the bully doesn't want to be seen as a bully. Otherwise, humor is unlikely to help. Bullies fear harm, just like everyone else. To make the bullying stop, convince the bully that if the bullying continues, severe harm is inevitable. Someone who has never been bullied can't really understand what it's like to be a target. Someone who has never been bullied by this specific bully can't really understand what it's like to be a target of this bully. The trouble between the bully and the target isn't a "personality clash." There is no such thing. Targets cannot end the bullying by trying harder to "get along." The bullying isn't about the target's misbehavior. Bullies don't bully their targets to "get even" for their targets' past offenses. They bully their targets because of inner compulsions that the bullies don't yet know how to control — or don't yet want to. aren't rational.be persuaded by rational argument to stop bullying. Their inner compulsions aren't rational. Being bullied isn't the target's "fault." Letting a bully abuse someone else without end isn't a way to avoid becoming the next target. Bystanders who are aware of the bullying and don't act to stop it share responsibility for the bullying. They aren't innocent. Many organizations claim, "We don't hire bullies." Horsepucky. All organizations hire bullies, mostly unintentionally. The key word is "mostly." Trying to resolve a bullying issue with conventional conflict resolution techniques is like bowling with golf balls. You might knock a pin down here and there by chance, but it would be a freak occurrence. Would you like to see your comments posted here? rbrenpfcfjCucpffnJiIQner@ChacNUnvbogDtYOsTvzLoCanyon.comSend me your comments by email, or by Web form. I offer email and telephone coaching at both corporate and individual rates. Contact Rick for details at rbrenquJVqVknMoQczeetner@ChacEULnqVhxohinOARvoCanyon.com or (650) 787-6475, or toll-free in the continental US at (866) 378-5470.